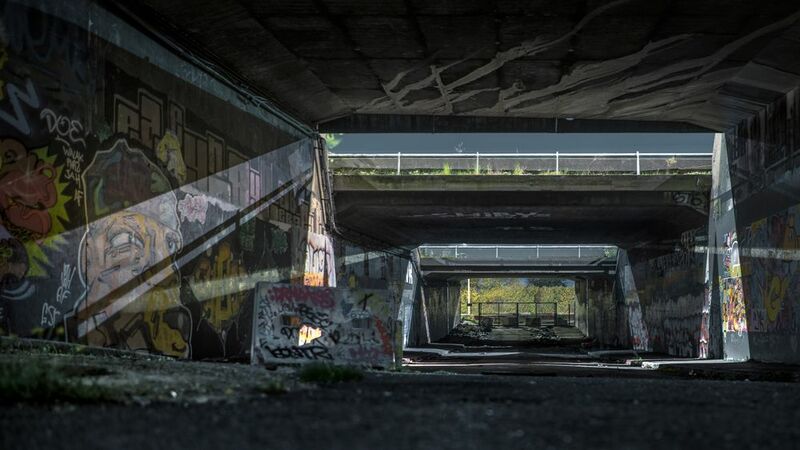 Through the cracks of an underpass, beams of light refract onto the walls in the distinct shape of a capital ‘A’. French photographer Rémy Soubanère pays homage to Alphaville (a dystopian classic from the 60’s) in more ways than one. He molds narrative and atmosphere out of an abstract vision, echoing Jean-Luc Godard’s ability to create a futuristic setting out of creative angles and surrealist imagery alone. Terror laces the image, as if the authorities are up in their helicopters, scouring the streets for degenerates. Soubanère suggests that technology and society have become so oppressive, that civilians hide in the crevices of the city—seeking refuge from surveillance. Situated in the Parisian suburbs and saturated in today’s political climate, Soubanère’s unstaged shots reinforce the knowledge that our bizarre, contemporary reality borders on fiction. “This is where I live, in the hours I live”, he says. “I find things oversized and unreal. This environment opens up my imagination”, bringing Alphaville to mind, and other “moody movies” from the past. His somber photographs are desolate and weighty. The darkness veils forlorn playgrounds, iron infrastructure dominates the landscape, and the lack of human presence in these vast, man-made terrains leaves the viewer feeling hollow at the prospect of automation. Recently it seems that wherever you go—whether catching a train or sitting in a cafe—people are cradling a copy of Orwell’s 1984. Shortly after Trump was elected, the classic shot up to a best-seller on Amazon. Although we’re a little far off of hiding the covers of our novels with paper bags, protecting our personal explorations from the spying eyes of surveillance, the book’s revival speaks volumes. Soubanère isn’t alone in questioning whether this radical fiction from the forties was in fact an accurate prediction. There’s an anguished irony to the series; humanity must coexist with the hostility of the man-made. Soubanère explores how we live with “dispositifs”, a concept that has been translated variously from French as ‘machinery’, 'apparatus’ and 'construction’. Philosopher Michel Foucault coined the term to reference social systems that govern certain aspects of our lives—from the architectural shape of our cities, to the way we live our intimacies. In this series, the absence of people is haunting. 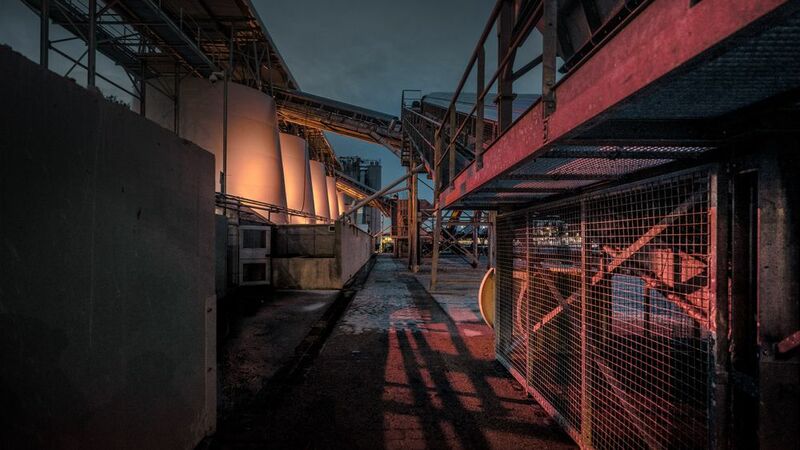 Intimidating metallic structures soar across each frame, the only light is synthetic–even weeds struggle to survive amongst the dominance of train tracks and vast stretches of stone. With more sign of life underground than over, it seems that these dispositifs have intimidated civilians into living a life that’s out of sight. Godard’s protagonist Lemmy Caution navigates his way through Alphaville, ceremoniously documenting the absurdities with his camera for those living in ‘The Outlands’. He says he’s too tired to argue over what’s wrong and right, his camera will do the talking—his “only weapon against fatality”. Orwell’s torturous ‘2+2=5’ chapter comes to mind when Soubanère says, “Humans don’t need to know the truth, we just need to believe something. Trump & Co. really understand this, and that’s how we’re here today.” Like Caution, Soubanère uses photography in combat and with a moral compass. The dystopian aesthetic is not a warning for the future—Soubanère seeks to arouse consciousness and critical thinking within a gloomy present. “The truth is out of reach in my eyes. But we can build opinions that are as sharp and accurate as possible. It involves criticizing, not believing. But first we must admit that we don’t have truth.” It’s a dark time where politicians control the news, and the people are as good as sedated, as to not interfere with the reinforcement of a capitalist structure. Soubanère captures the consensus entirely. Today, you may find “DOWN WITH BIG BROTHER”, or political slogans of a similar nature, graffitied on the walls of an underpass. But in a totalitarian dystopia where freedom of speech (even freedom of thought) is met with severe punishment, a subtler, more sophisticated form of rebellion must be exercised. Much like Orwell’s “Brotherhood”, a revolt must be so ambiguous and so intelligent that it only resonates with those looking to revolt. 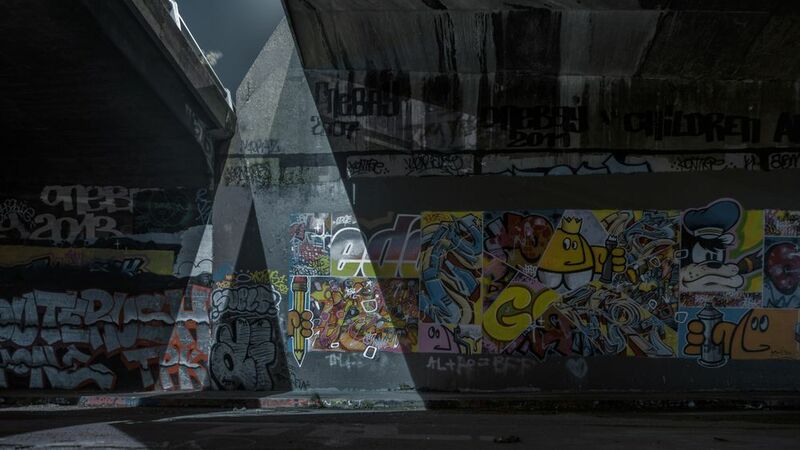 With his camera—a method of expression that promises the author’s anonymity—Soubanère catches the exact moment the light bends the shape of an ‘A’ on underground walls. Only to be seen by those hiding in the crevices. Then again, perhaps Soubanère’s capital ‘A’ doesn’t stand for ‘Alphaville’ at all. Perhaps it stands for Anarchy. See the published article on LensCulture, here.